Sometimes, it takes a little extra effort to get a dish right. We’re gonna eventually get to plum chutney here. Stick with me. The buttercream took me two tries. The cake took three. After the second try my Mom suggested that a plate of cookies would be “just as special,” but I was determined. 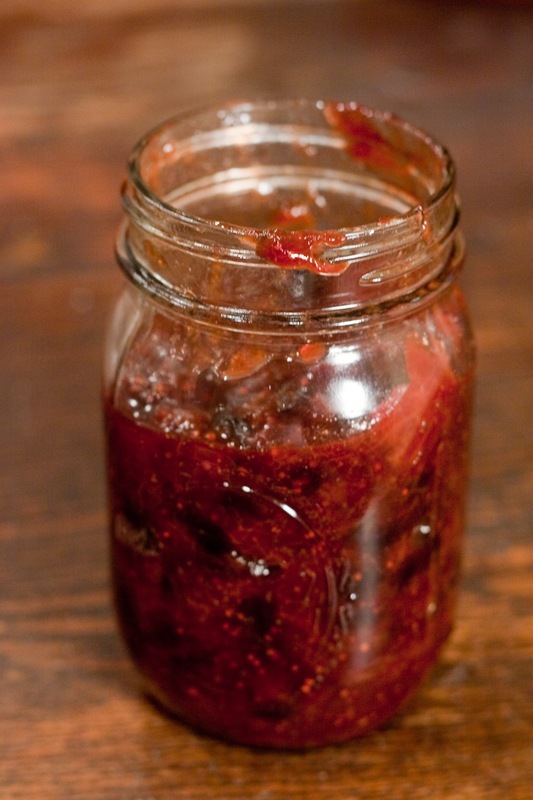 What does this have to do with plum chutney? In the test kitchen this week we tried four different versions. There was broad disagreement on a winner, ultimately, because there wasn’t one. I woke up Friday morning determined to get it right. My Saturday morning demos at Eastern Market are a passion and while I don’t want to let “perfect” be the enemy of “good,” just good is never good enough. After reading another fifteen chutney recipes, a new plan emerged. Ginger and cardamom were replaced by cinnamon and star anise. A different vinegar, Roasted Red Pepper Blackberry, offered more depth, spice and acidity than its predecessors. More sugar brought out the fruit that had been dull in previous attempts. The extra effort paid off at dinnertime. The chutney paired wonderfully with salt-and-fennel crusted, roast pork tenderloin. Or just spread it with cream cheese on a bagel. My test batch at home included jalapeño but I didn’t see any at the market this week. It tasted great both ways! *One of my favorites from Sapore, well worth the online order. Can’t wait for it to ship? Try 1/2 white vinegar and 1/2 Sherry vinegar for both high acidity and depth. 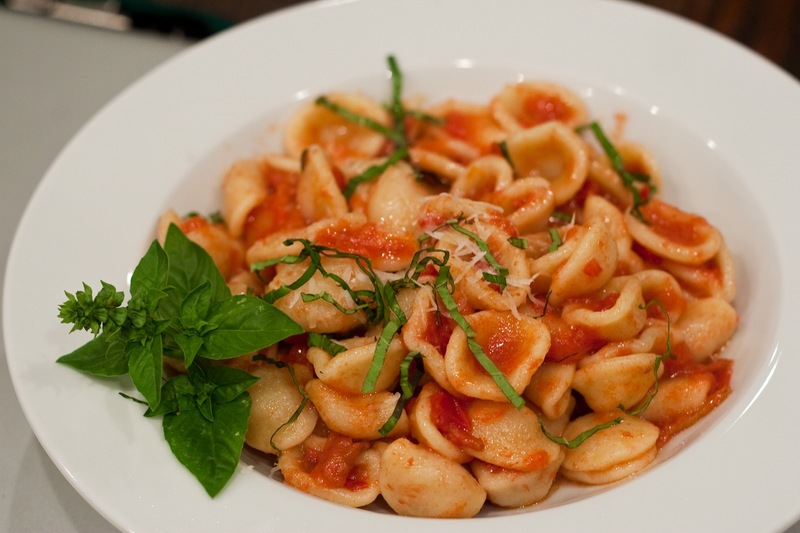 Mix together ingredients in a 3-quart saucepan and cook 30 minutes, until thick and bubbly. The plums will release a lot of liquid. 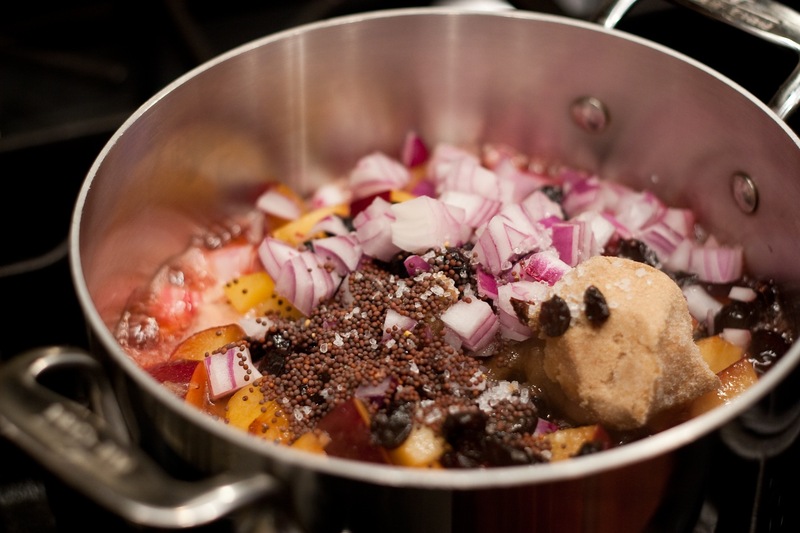 Start heat at medium high and lower as chutney reduces to avoid burning. Remove cinnamon and star anise pods. Cool to room temperature and chill. The chutney will last up to a week in the refrigerator, or can be canned or frozen. It’s 5pm, and today has been long. The last thing I want to do is go home and cook, at least, not until I’ve opened a bottle of wine, which usually leads to an hour of sitting on the couch followed by dialing for dinner. I’ve got a fridge filled with ripe tomatoes, sugary-sweet peaches, sockeye salmon and crisp green beans. Honestly, I would rather debate Miley’s new haircut (get over it!) than face another night of steamed veggies and baked fish. I’ve just killed your buzz. Here you are thinking that I will arrive home with a basket of farm fresh produce on my arm to be lovingly prepared, while discussing the events of the day with my loving husband soothed by a soundtrack of jazz vocals. A long-stemmed glass of something fabulous in hand, we’ll sit down to a candlelit evening at the dining room table, cloth napkins draped over our laps. For real?! I’ve got a full time job, I’m beat and I want cheap Chinese and glass of whatever I know I won’t really taste after the second glass anyway. Which is when I think about compound butter. Rolled in my fridge is a pound of farm-fresh, Amish butter (yes, from Dan at Agora). The other night I softened it and folded in fresh cilantro, lime zest, cumin and scallions. In under 30 minutes this evening I can sear a salmon filet, dress a salad and steam those green beans. A thin slice of the cilantro-lime butter will melt over the cooked fish. I’ll toss another with the beans. Suddenly I face the prospect of a richly sauced, yet light, healthy dinner on the table. Plus, it’s cheaper than eating out, so we can treat ourselves to a good bottle. Something bubbly. 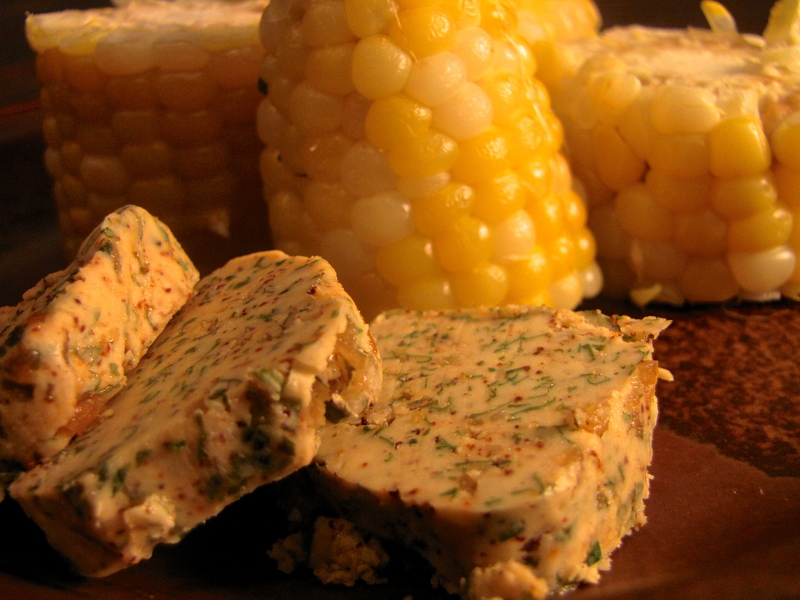 Slices of the compound butter can be spread on fresh corn-on-the -cob, grilled meats or hearty fish like tuna or salmon. Try tossing a tablespoon with steamed green beans or zucchini. *Or Champagne vinegar. I bought mine at Sapore. 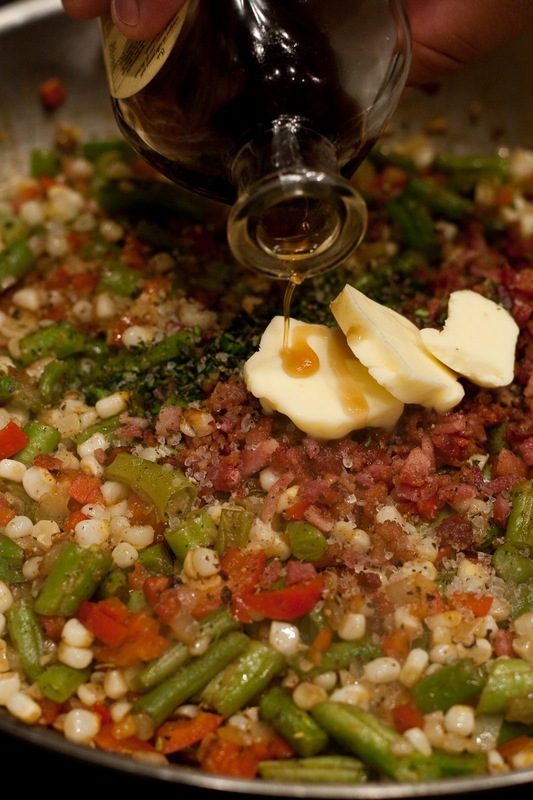 Soften the butter at room temperature and stir it briefly in a medium bowl until creamy. With a rubber spatula, fold in the dry spices and lime zest. Fold in the vinegar a few drops at a time. Fold in the scallions and cilantro. Using a piece of wax paper or plastic wrap, roll the butter into a log and refrigerate until firm. Watermelon is not a very good vegetable. Remember when you discovered that tomatoes are a fruit? You were five, maybe six, and so proud of this strange, new fact that you proudly, hands-on-hips, told anyone who would listen. Your kindergarten classmates responded with doubt and disbelief followed by acceptance and awe, running off to spread the gospel. Fruit or not, tomatoes are still at their best when savory, sugars perfectly balanced with acidity and salt. Watermelon is also a fruit, one which, a few years back, chefs decided to pair with tomatoes and treat as a vegetable. Watermelons, however, are a poor excuse for a vegetable. Their flavor, when savory, is herbal and watery, their sugary sweetness easily lost. 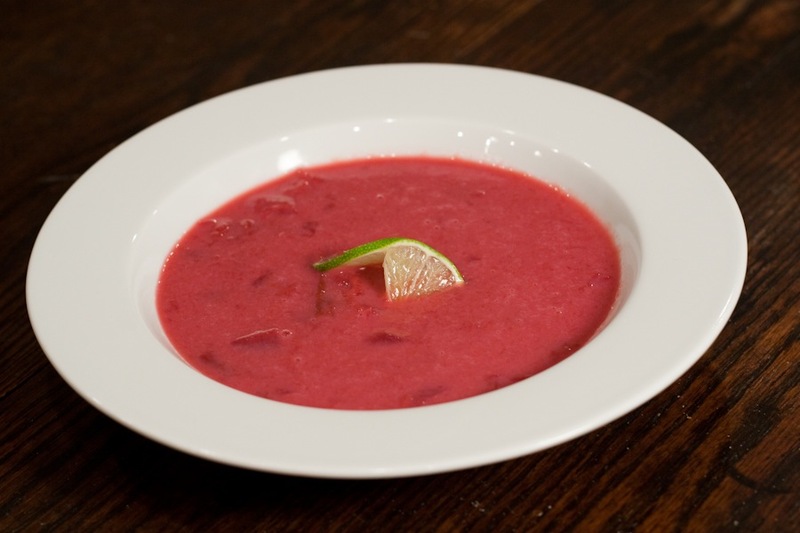 We discovered this developing a watermelon gazpacho. 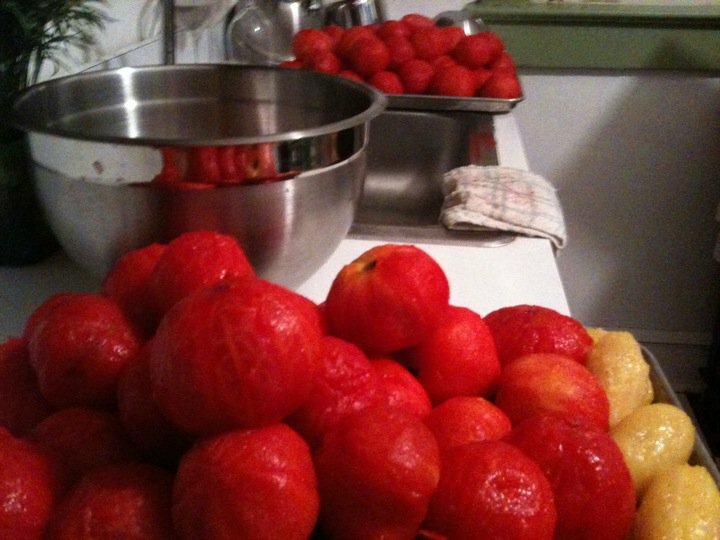 We mixed Brandywine and Purple Cherokee tomatoes and sweet crisp watermelon with candy sweet onions and a pinch of salt. The tomatoes were delicious. Brandywine and Purple Cherokee are the pinnacle of a classic beefsteak, thick and meaty, a perfect balance of sugar and acidity. The watermelon was weak, barely there. A drizzle of honey brought it back. Fresh basil gave life and depth. Pressing additional fresh watermelon through a food mill provided the extra liquid we needed and a splash of pomegranate vinegar delivered a perfect finish. The salt brings out the flavors in the tomato and the honey make the watermelon pop. You’re looking for a good fruity, vegetal balance. 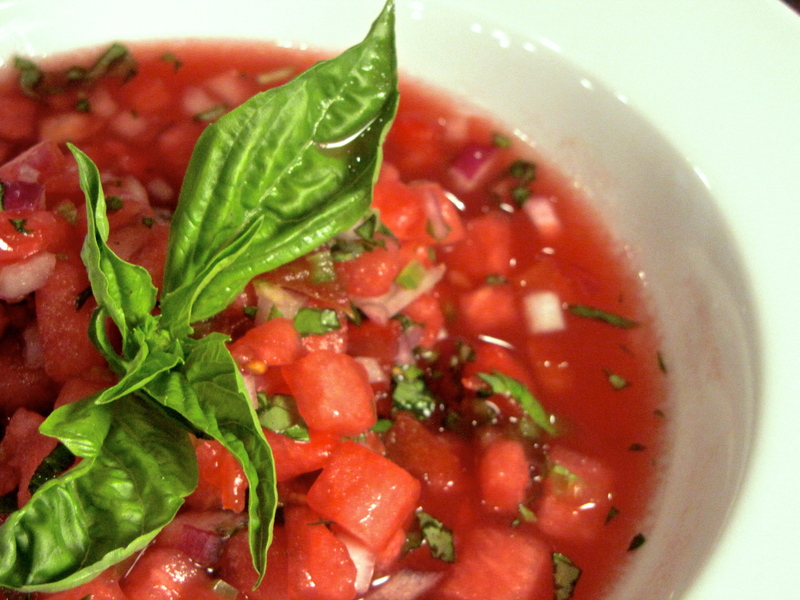 Leave out the watermelon juice, add some cumin and serve this as a salsa over fried fish tacos! *I got mine at Sapore. 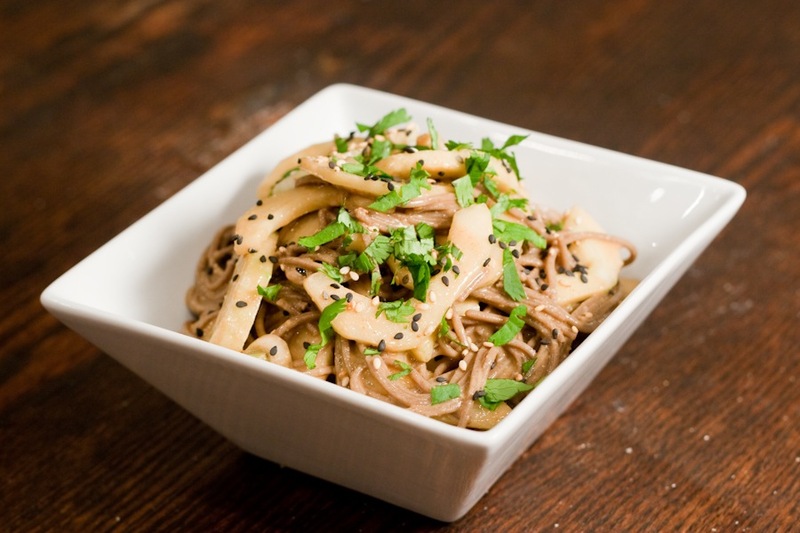 A good, mildly acidic, red wine vinegar can be used instead. 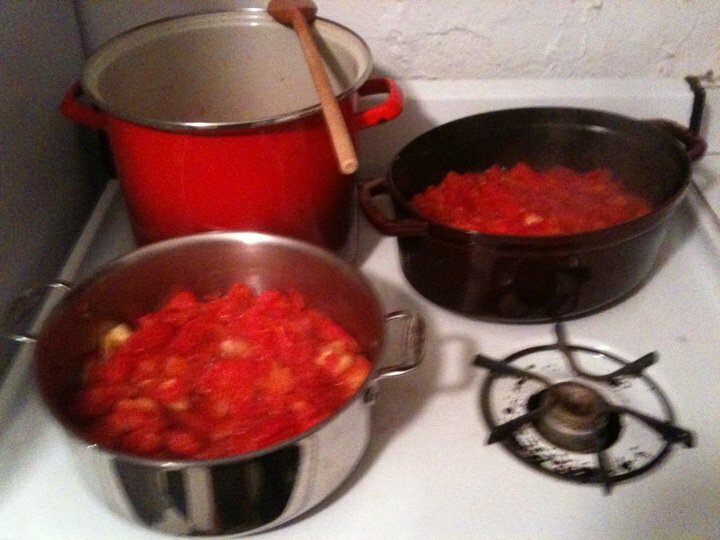 Mix together 4 cups of the watermelon with the tomato, and onion. Add lime zest and juice, jalapeño and basil. Stir together. Season to taste with salt, pepper and honey.